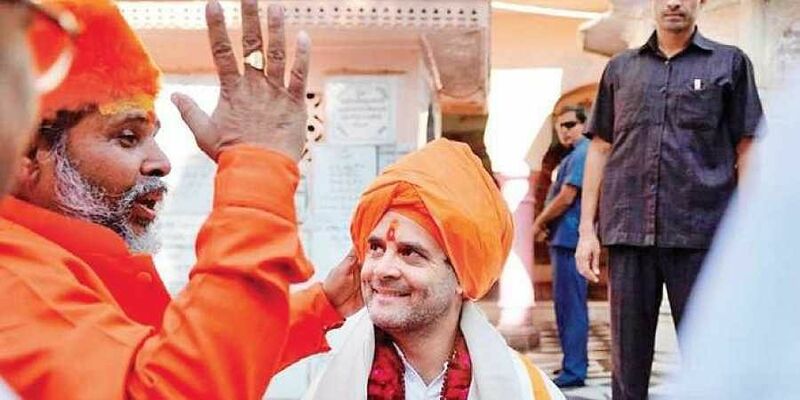 Rahul Gandhi revealed his 'gotra' on Sunday at the Brahma temple on Pushkar Lake. PUSHKAR: For a temple priest to figure in the centre of a raging political debate, even if innocently, is rare. But then the Brahma temple on the Pushkar Lake, which traces out a near-circular shape in the heart of this holy town, is a rare and precious thing. It is one of the few existing temples dedicated to the Hindu god of creation, certainly the most prominent one, and is embroidered with a rich weave of myth and lore. And ever since Congress president Rahul Gandhi decided to declare his ‘gotra’ at the temple, it has also become part of India’s political lore. Rahul’s religion has long been the target of jibes and grist to the rumour mill, thanks to his political opponents. His temple-hopping during recent elections is in ways a response to that — it turned into the topic of such an intense political slugfest that his party recently came out to assert, controversially, that he’s not just a Brahmin, but a ‘janeudhaari’ (sacred thread-wearing) one. What is your gotra, his opponents had asked, derisively. The next step came here at the Brahma temple in Pushkar. The priest asked the same question of him, as part of ritual formalities this time. And Rahul said he’s from the Dattatreya gotra of Kaul (Kashmiri) Brahmins. The priest who asked the question incidentally, carries the Kaul title too. This paper spoke to Pandit Rajnath Kaul, the man who found himself in the centre of a national debate, on Sunday. “It was just an incidental question from me and an incidental reply from Rahul Gandhiji, without any prior prompting,” he said. The issue has since snowballed into the topic of major sparring, with allegations of invalid caste genealogies as well as of casteism, coming as it did, in the midst of the Rajasthan elections, where the BJP and the Congress are pitted against each other. Many see Rahul’s declaration as an attempt to scotch all speculation regarding his caste lineage, without which clinching membership in the Hindu religious order still seems a daunting task today. But it has fuelled a further unsavoury debate on whether he can be entitled to be a true-blue Dattatreya or not, through matrilineal descent. But the jibes over whether he is a Hindu (recall the Somnath temple controversy last year) have now been replaced by whether he can claim his grandmother Indira Gandhi’s father’s Dattatreya gotra! The priest claimed he has been getting several threatening calls asking him how he sanctioned the gotra for Rahul. “I did not prompt him, he said it himself!” All that he claims he did was introduce his family to Rahul.